You will receive an email confirming your registration from Eventbrite. It is not necessary to print your ticket. You will receive a reminder email with supply list and kit information prior to class. Please respond to the reminder to confirm your attendance. Kit fees are payable at class. If you are unable to attend a club class for which you have registered, please notify us as soon as possible so that we can contact someone on the waiting list. When registering for a non-club class, class fee and kit (if included) must be paid at time of registration. Select 1 ticket (or more if also registering a friend) and “Add to cart”. Return to Class Calendar and select additional classes if desired. Proceed to checkout after all classes have been selected. You may check out as a guest or create an account. Enter billing information. Payments can be made by Visa, Mastercard, Discover or Paypal. You will receive a confirmation email. A seat and kit (if applicable) will be reserved for you. If you are unable to attend a class for which you are registered and paid, a store credit will be issued for the class fee with one week’s notice and any kit will be held for you. No class fee refunds with less than one week’s notice. If you are unable to attend a session of an ongoing class, you are responsible for picking up any handouts or files provided. For individual instruction for a missed class, you can attend a UFO class or schedule a private make-up class at a cost of $20/hour. 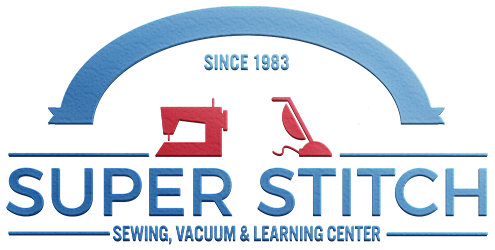 For any classes requiring a supply list other than a pre-cut kit, fabrics must be purchased from Super Stitch.